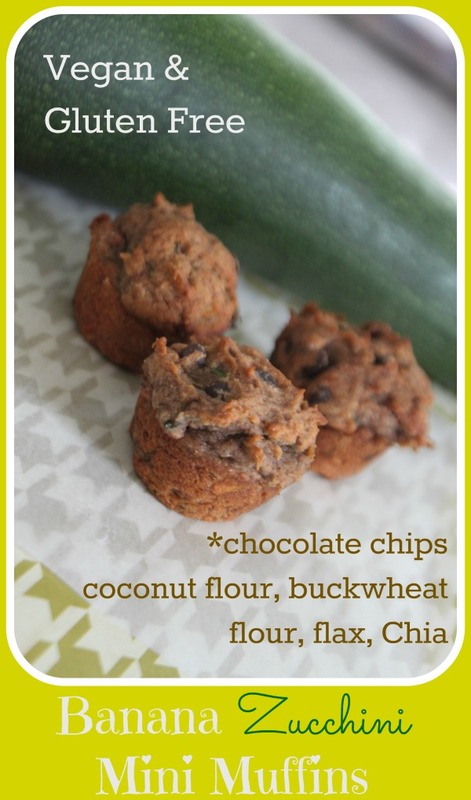 MamaEatsClean: Banana Chocolate Chip Zucchini Mini Muffins - Vegan, Nut free and Gluten free - Yay! Banana Chocolate Chip Zucchini Mini Muffins - Vegan, Nut free and Gluten free - Yay! This week is back to work for me. And into Grade One for my oldest daughter. My daughter that has food sensitivities to gluten, dairy and eggs (not to mention the dozens of other things on the list). So feeding her has been a bit challenging but we are getting things figured out. Unfortunately one of those things is that her favorite grain free banana bread just doesn't want to co-operate with no eggs. So I was back to the drawing board on the banana bread. And since school was starting I figured I should try and make it nut-free anyway (no almond flour) so I took another stab at it. This time I didn't go grain-free. I can't eat banana's anyway and the rest of the house is not 100% grain free so why not. The kids LOVED these muffins. Loved so much I made three batches in two days. And they are full of banana and zucchini. And very little honey. So you can feel great about feeding them to your little ones and they are safe to send to school. 1/2 cup unsweetened milk - use hemp, coconut or flax milk to make it nut-free. Otherwise I would use almond milk. Preheat oven to 325 degrees. Grease 24 mini muffin tins with coconut oil or butter. Split batter evenly in greased muffin tins and bake for 40 to 50 minutes until center is fully cooked. I didn't use a liner and they came out really easily.